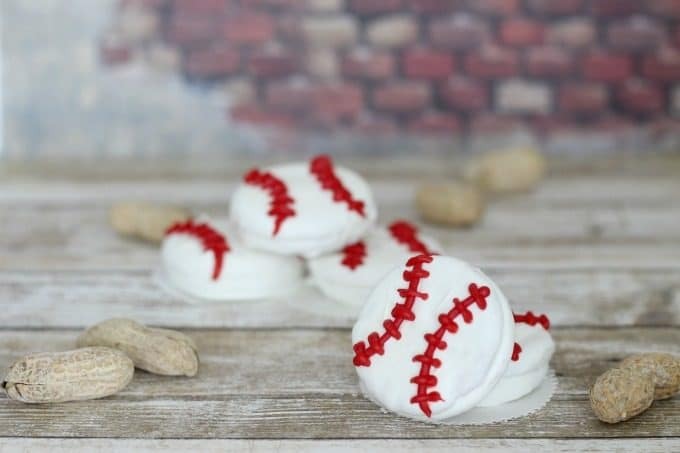 These delicious baseball cookies are perfect for your sports themed birthday parties, when you have friends over to watch the game or even for a fun little league treat. 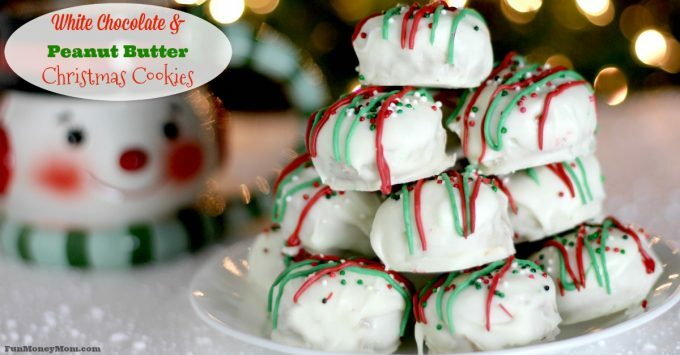 Not only are they tasty, they’re easy to make too! 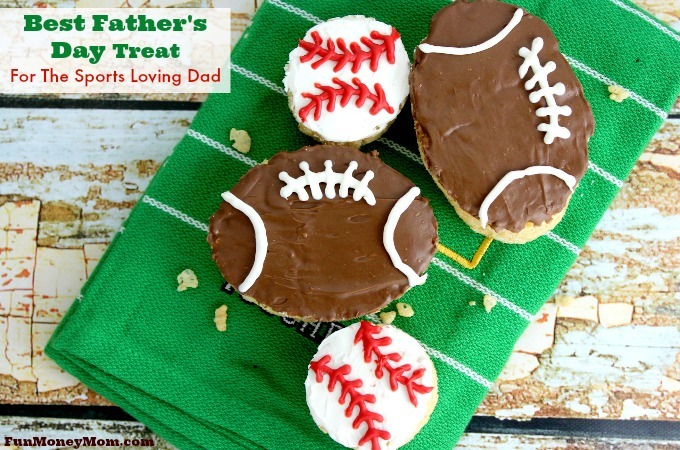 Looking for a fun sports themed treat? 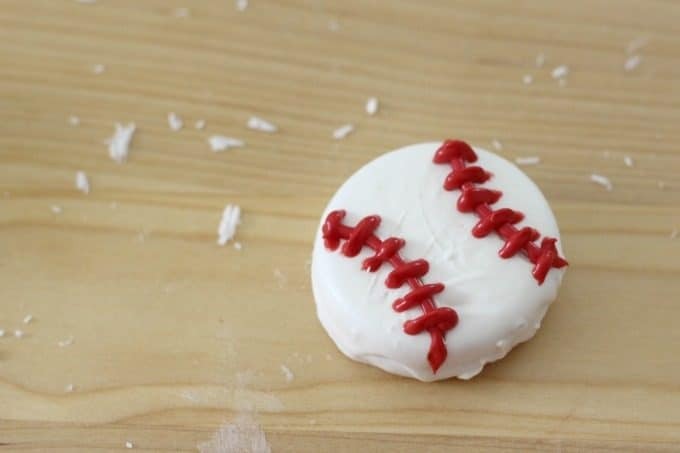 I recently made these baseball cookies and love the way they turned out. Not only that, they were pretty easy to make. 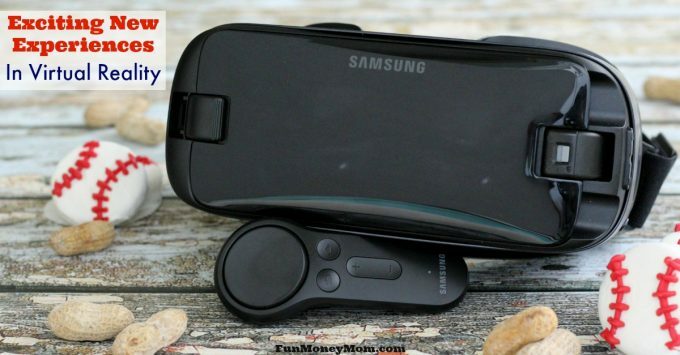 Just check out the video to see for yourself! 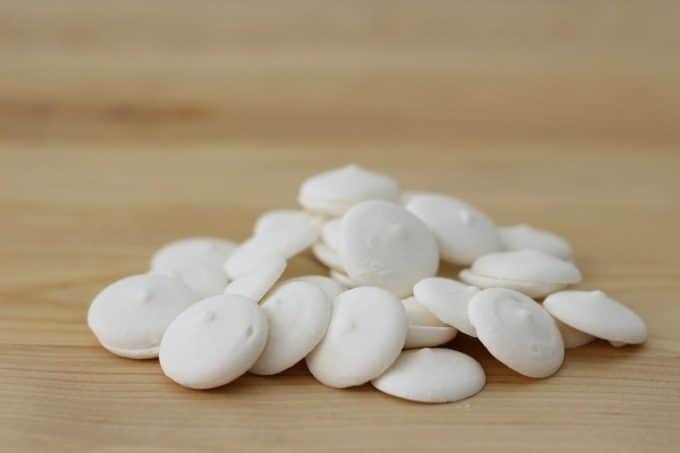 You’ll start with Wilton candy melts, one of my all time favorite ingredients! I love these because you can make so much with them, from chocolate hearts to candy corn cups. If you read my blog on a regular basis, then you already know that I’m a little obsessed! 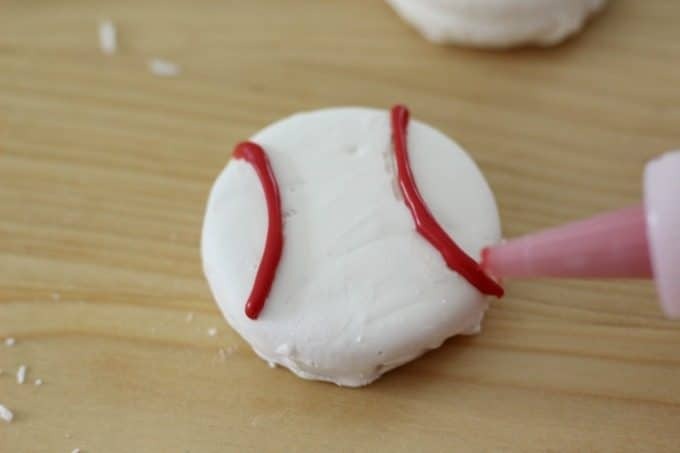 You’ll need 2 cups of white melts for dipping and 1/2 cup of red for creating the baseball stitches. Of course, you’ll need cookies too. 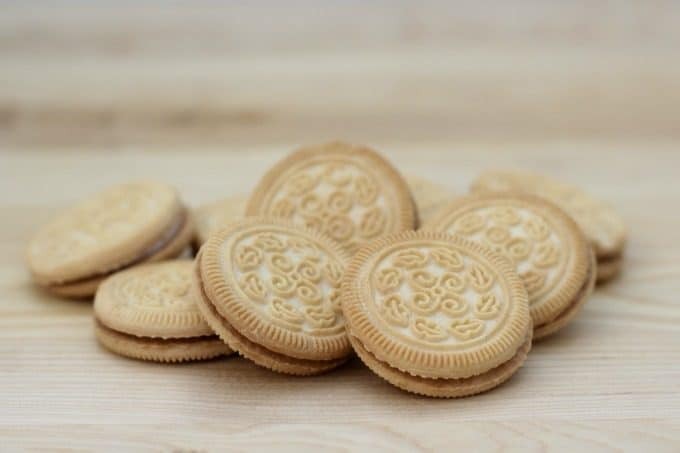 I used vanilla cream filled cookies but you can use chocolate cream filled cookies, ‘Nilla Wafers or any other kind you like. Being round is the only real requirement. Put your white melts in a bowl and microwave them for 60 seconds. Stir. Microwave 30 seconds more and stir again. Keep microwaving in 30 second increments until the chocolate is completely melted. I also like to add a little vegetable oil (about 1/2 tbsp) just to make it more smooth and creamy. 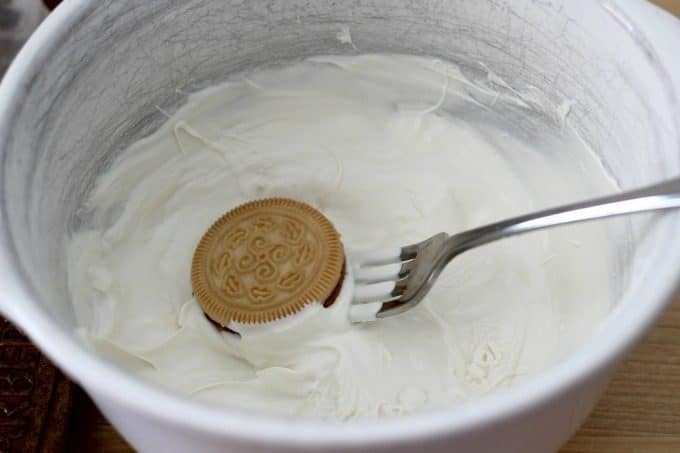 Using a fork, dip your cookie in the chocolate, then flip it over to cover the other side. Tap the fork lightly on the edge of the bowl to get rid of excess chocolate. 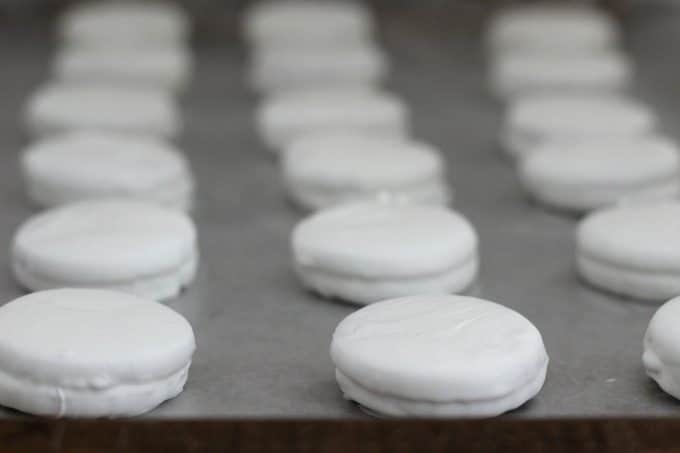 After you dip each cookie, place it on a wax paper lined cookie sheet. Once the sheet is full, put it in the refrigerator to allow the chocolate to harden. It doesn’t need much time, about 15 minutes or so. Here’s a trick I saw on Pinterest once. 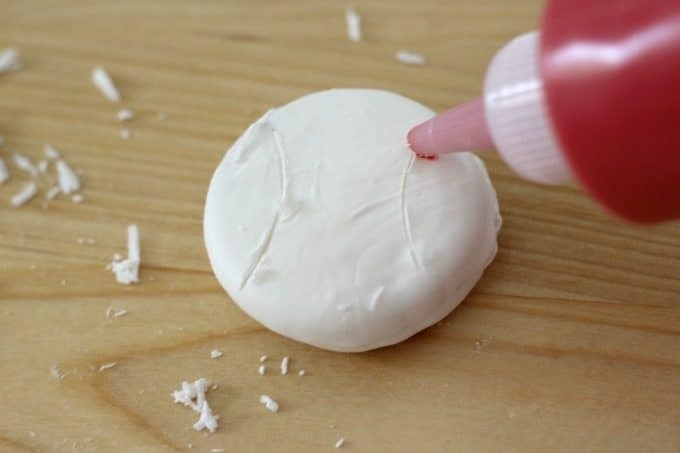 Take a round cookie cutter (or the bottom half of a snowman, which was all I could find), and make a groove where you want the baseball stitches. This will make them look more symmetrical. Once you’ve made grooves in all your cookies, microwave the red candy melts for 30 seconds. Continue to melt in 30 second intervals until the candy is smooth. If you have a small plastic bottle, use a funnel to fill it with the melted red candy. I love these plastic bottles and use them for everything but if you don’t have any on hand, you can use an icing bag instead. No icing bag either? 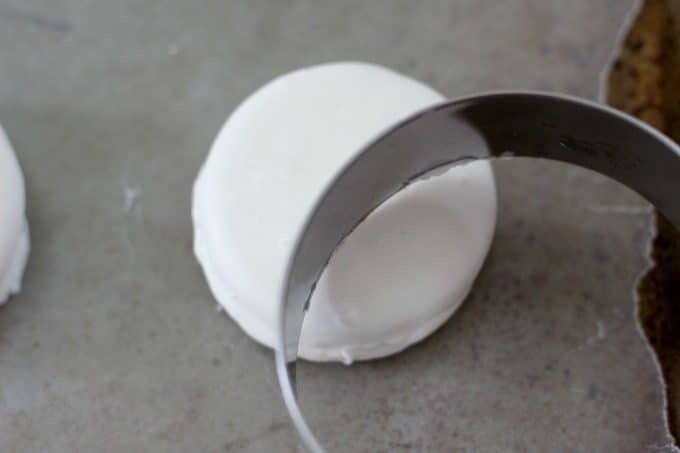 Cut a very small corner off a sandwich bag and fill that with your melted candy. Trace over the grooves with the red chocolate. Next, make the stitches. I found this part easy but it was a little time consuming. Now your baseball cookies are ready to eat! This recipe made 15 delicious cookies. 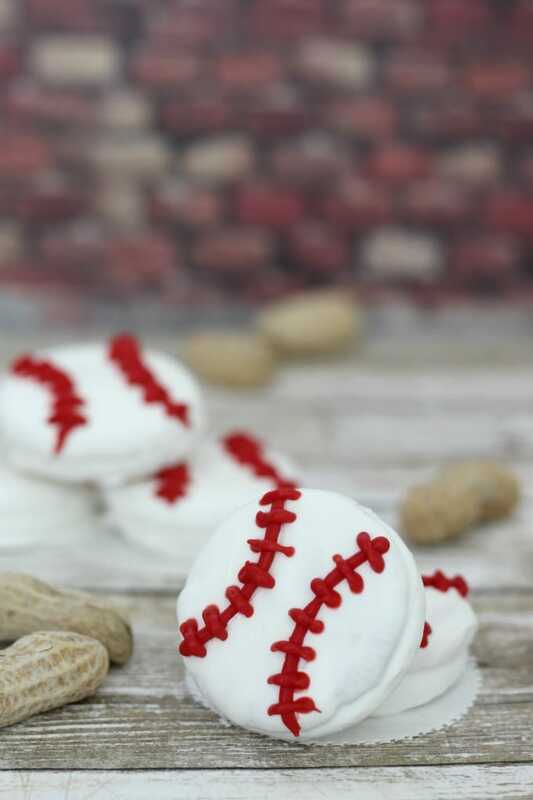 These are so perfect for a sports themed birthday party, a snack for the little league game or a fun treat to enjoy while you watch your favorite team play. Hmmm…now I’m thinking that I can make basketballs, golf balls and maybe even soccer balls! 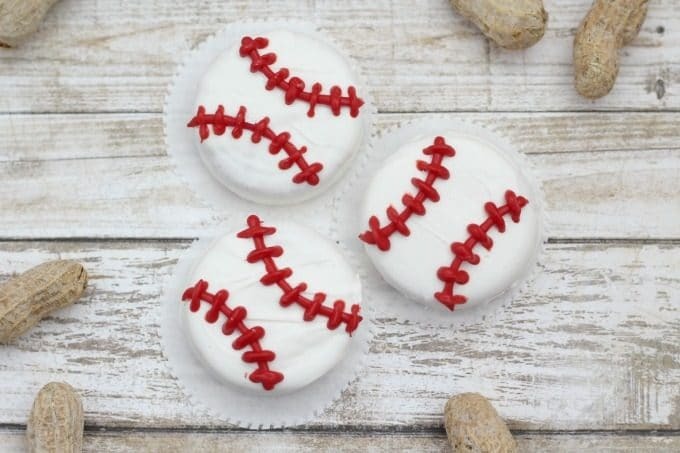 Who would you make these baseball cookies for?